1986-89 BA Hons Fine Art Goldsmiths College, University of London. Clare specialized in experimental film at Goldsmiths College and after travelling widely across Europe, Israel and India settled in Wales where she worked as an artist, sculptor in wood and furniture maker. 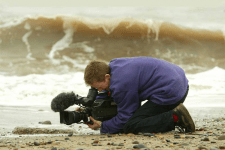 She set up Grain of Sand Films in 1999 and directed, filmed and edited films for voluntary organisations and the private and public sector. She also ran accredited filmmaking workshops for arts and media organisations in Wales, Salford, Manchester and Calderdale. 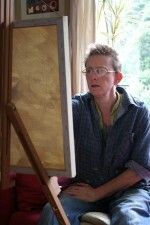 In 2012 she returned to drawing and painting, wanting to work directly with materials and move away from the computer screen. Her practice is experimental and intuitive. She is inspired by the landscape surrounding her home, the seasons and the elements, as well as interior enquiries into the nature of the mind, and existence.